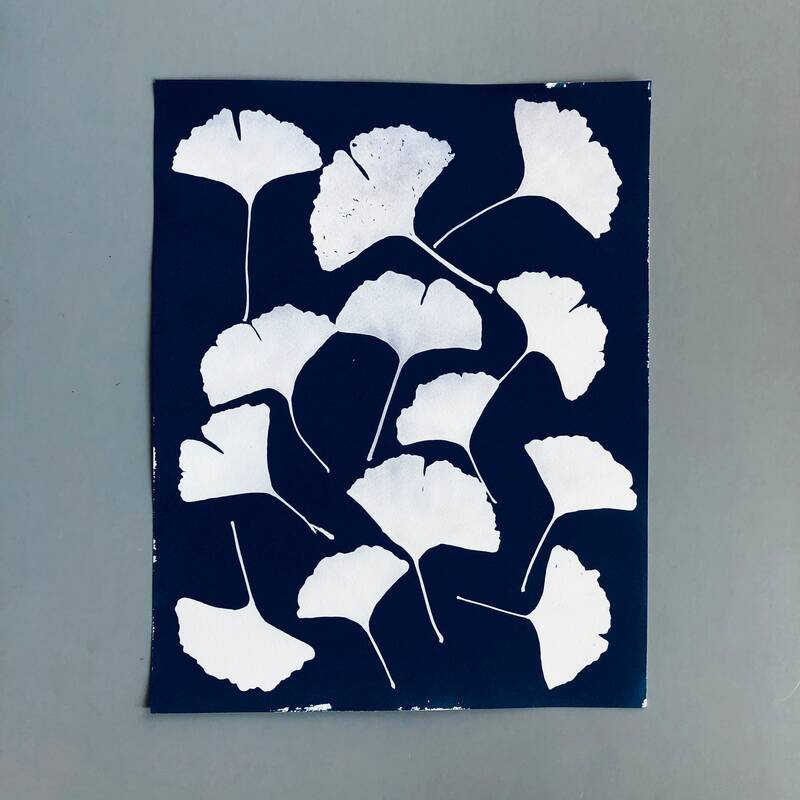 Cyanotype Photogram of Gincko leaves collected in Central Park, NYC (2018). 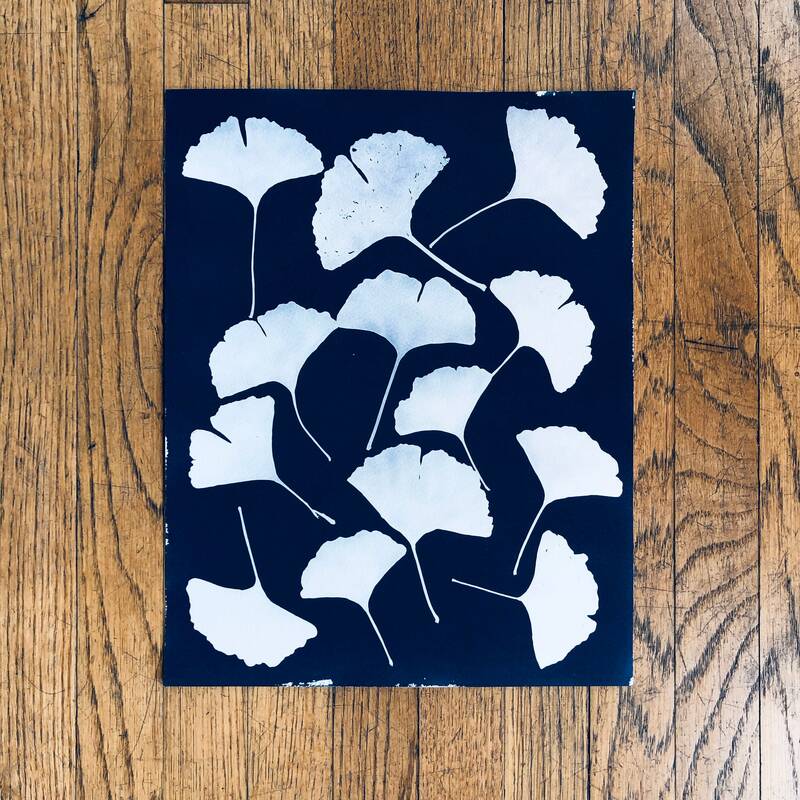 The cyanotype is a fantastic 19th-century photographic printing process: it is quite simple, elegant, and magic (camera-less, no ink involved!). But, above all, it is always blue, deep blue. 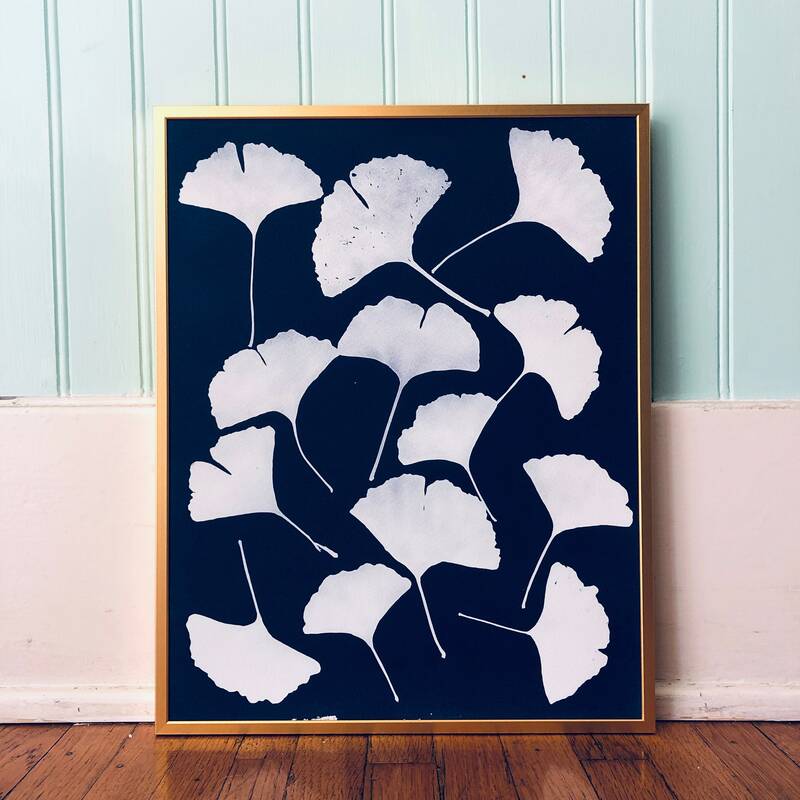 -	Every cyanotype will arrive carefully protected with an acid free unbuffered tissue and a cellophane archival bag and packaged in extra-rigid fiberboard photo mailer envelope. 1. I walk. I collect. I document. The herbarium is the archive of my walks (and memories). 2. I select the most exquisite quality watercolor paper (100% cotton, 140Ib/300gm). 3. With a hake brush, I hand-coat the paper in the dark with a chemical formula that only involves two compounds: ferric ammonium citrate and potassium ferricyanide. 4. The paper is dried in the dark and stored in a light-proof bag until its use. 5. When it's sunny (in Los Angeles this is all year round!) I place the paper under a specimen from my herbarium and cover it with glass to avoid specimen displacements. 6. The exposure takes a few minutes under the rays of the sun. 7. Merely washing the exposed photogram turns the exposed areas into a vibrant Prussian blue and makes the cyanotype permanent. As long as the specimens are not broken (the loss of a small delicate part of a leaf or alga can occur while handling), the image can be repeated from one copy to the next. However, the hand-coating and specimen placement are unique every time, creating a one-of-a-kind finished photogram. This results in slight variations to the photos shown, making each print unique. 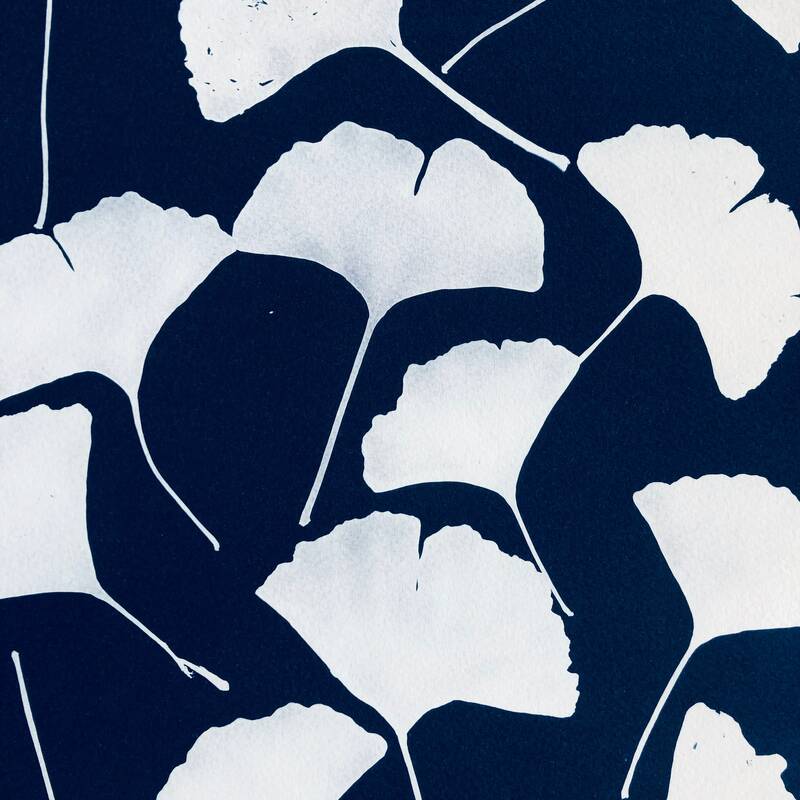 This is part of the beauty of cyanotypes! The cyanotype process is among the most permanent of all photographic processes. 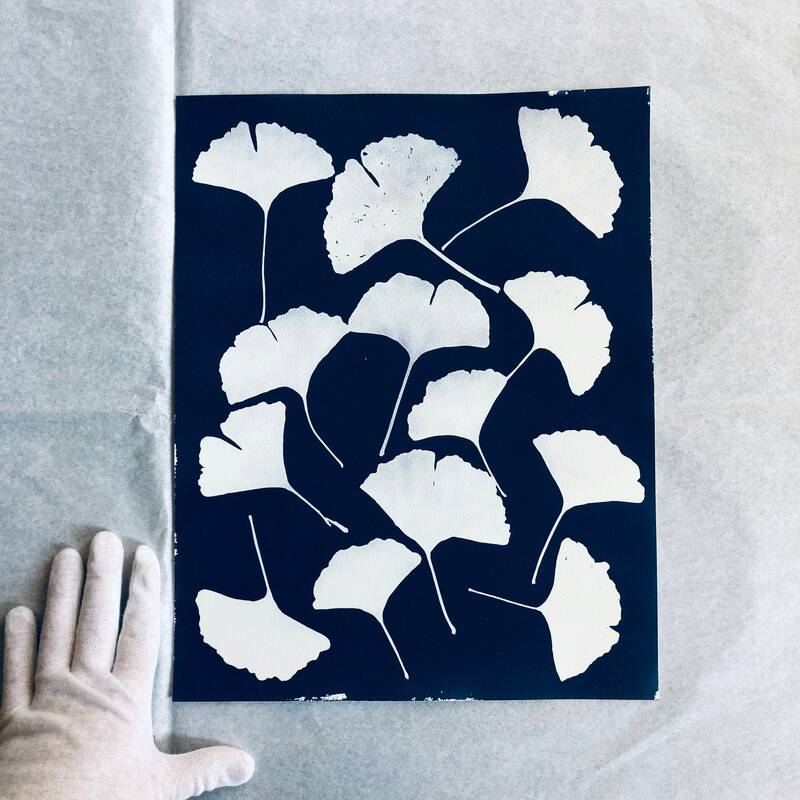 However, cyanotypes are sensitive to alkalinity, and they should be stored in chemically neutral and unbuffered materials. Of course, I provide the appropriate archival supplies with each shipment! Exposure to direct light should be avoided to prevent the image from fading, as well as excessive dryness. However, "faded" cyanotypes will regenerate if stored in the dark in moist conditions. To fulfil your order, you must provide me with certain information (which you authorized Etsy to provide to me), such as your name, email address, postal address, payment information, and the details of the product that you’re ordering. You may also choose to provide me with additional personal information (for a custom orders), if you contact me directly.